The fast-paced action platformer Guns, Gore & Cannoli had gone through some very rough patches lately. The demo was well received last year, but the kickstarter campaign was a disaster and for a while it seemed like Claeys Brothers Art and Crazy Monkey Studios pulled the plug. However, Vinnie Cannoli seems to be able to withstand anything someone throws at him and thus, the game is out now on Steam. 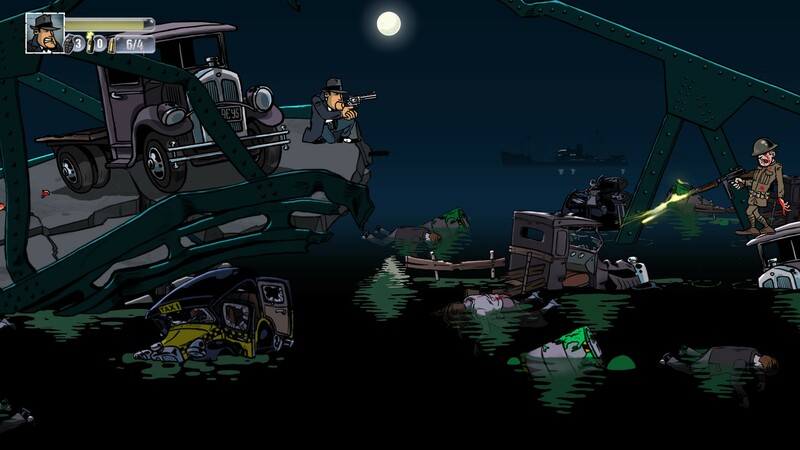 Get ready for some action-packed gangster gameplay in this side-scrolling shooter-like game. The ‘20s in Thugtown is a difficult era. Two rivalling mafia families do everything in their powers to make sure that the distribution of their illegal liquor is successful. This doesn’t go without trouble along its way and soon, the city is covered in lowlifes searching for brains as they’ve been turned to zombies. While the families try to survive this apocalypse of flesh-feasting walking dead, a goodfella named Frankie has gone missing. As per request of Mr. Belluccio, Vinnie Cannoli, a rough gangster himself, is sent to search for this important lad. His journey leads him directly into the mafia safe houses and along the path of the ever-hungry zombies. As he shoots his way through the horde of undead, he unravels the mystery of how these lowlifes turned for the worse. This is roughly the narrative of Guns, Gore & Cannoli – or at least the starting narrative. I don’t want to spoil too much of the story so I’ll leave it with this. The narrative itself isn’t too farfetched but it is still decent enough for a game that contains an overly used enemy as of lately – zombies. The game offers some unique hand-drawn 2D cartoon styled graphics with flawless animations. The background and foreground are cleverly designed to offer a 2.5D view to the game, causing the game to feel less “flat”. The visuals haven’t changed since the preview thus I can’t elaborate more on the neat cartoon style the game has. Many of the objects can be interacted with. This means you can shoot glass bottles and panels but you can also choose the path you take by jumping on stairs or simply walking past them. The cutscenes offer the same unique visuals, however they feel less animated than the animations during gameplay. Nonetheless, the visuals are a pleasure to play in thanks to the incredibly detailed indoor rooms and outdoor areas which are ever changing. The sound design is completely on par with everything the game stands for. 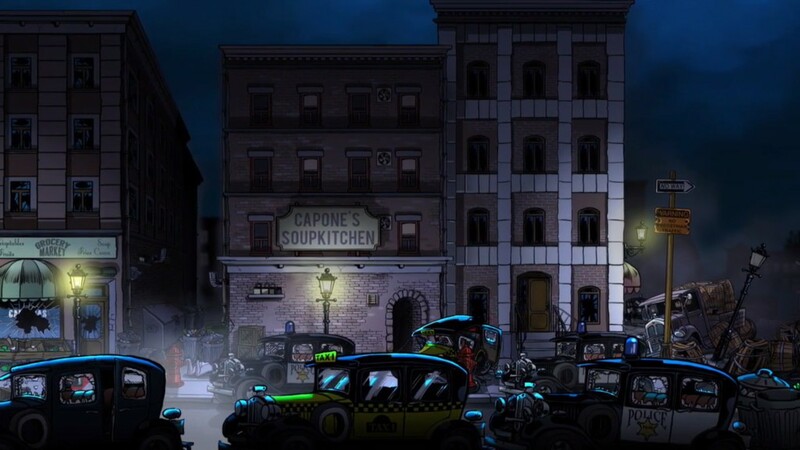 It’s mafia-themed with a clear inspiration of the ’20s era the game is set in. The audio design of the weaponry is incredibly detailed, much like the visuals in the game. In fact, you can even hear shells fall onto the ground or splash into the water. It’s truly great to see that not only the visuals have this amount of detail as it brings the game up a few notches to being almost perfect. A slight disturbing flaw in the sound design is that when you’ve opted to lower the sound settings, the dialogues during cutscenes will be far too quiet. The fact that the subtitles are not completely on par with the speeches given during these cutscenes only adds up to the frustration of the otherwise perfect designed game. As for the controls in the game, they haven’t changed since the preview. Both the keyboard and controller are near perfection. It’s not completely flawless as I noticed a trend of click once, shoot twice but other than that, the reaction rate is great. While the game is a 2D-2.5D platformer, the level design isn’t linear. There are certain levels which are comprised of straight-forward paths but most of the levels do have reasons for you to travel back or even up and down. Because of this non-linear level design, you’ll feel like there are puzzles in the game which aren’t really there. Even so, it’s a great feature. 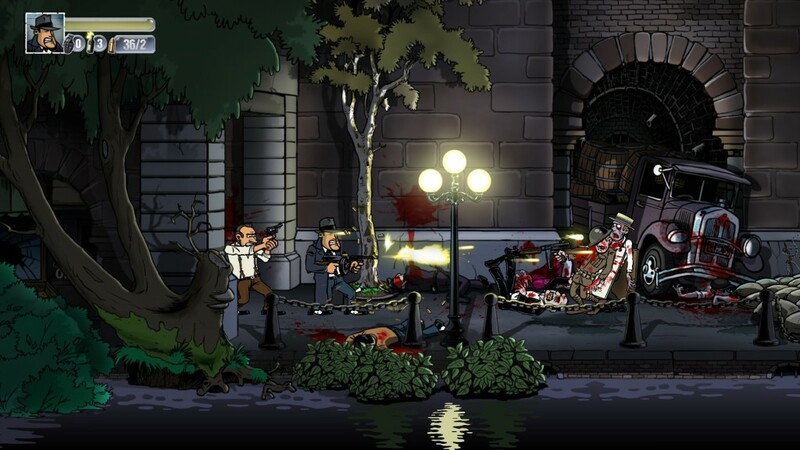 Guns, Gore & Cannoli is a fast-paced side-scrolling action game that has a nice variation of pretty much everything. Not only do the sceneries change, the enemies you’ll be facing do as well and the danger only grows allowing the difficulty to ramp up overtime but still fast enough. Gameplay-wise, there is not much to tell other than the fact that you need to shoot your way through the waves of enemies with a good variation of weaponry. These weapons are scattered around the levels, as well as boxes of cannoli – which serves as a health kit. Certain weapons are overpowered compared to other weapons and this will leave you wondering where the balance is but it’s not an annoyance. 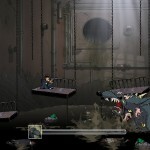 You can find several well-placed checkpoints throughout the levels – allowing players to purely focus on surviving. The ever-changing sceneries and enemies certainly keep the game entertaining but once in a while you’ll be facing a boss which ramps up the entertainment. While these bosses do not necessarily have any tricky mechanics to deal with, they’re not easily taken care off. This is mostly due to their large health pool but also because of your limited ammo. If you don’t like solo adventures through a city infested with zombies and other kinds of mutants, you can always request the aid of three friends for a local co-op. The game does have achievements but these are not implemented in the game itself. While this is not a feature that makes a game great, it would’ve been nice to see achievements or even game concepts as unlockables in the game itself. Guns, Gore & Cannoli can be considered as a brawler-like shoot ’em up built around a large variation of enemies, weaponry and platforming. Stunning as the visual design is, the sound design doesn’t lack much either except for an audio design flaw during cutscenes. Although the difficulty ramps up fairly fast – even on easy mode – the game plays well and has a decent narrative to look forward too, regardless of the overly-used concept of zombies. Being able to play co-op with up to four players is just the tip of the iceberg.